Why think about supply and demand? Do you pay attention to the cost of a cup of coffee? Most people recognize that when they make coffee at home it’s cheaper than buying a cup of coffee that someone else has made. You’ve probably also noticed that some coffee places are more expensive than others—a cup of coffee at Starbucks usually costs more than one at a gas station, for instance. Regardless of where you decide to buy coffee, the price can change dramatically. While retailers make decisions about how much they will mark up the coffee drinks they sell, the underlying coffee prices all around the world are driven by supply and demand. Brazil accounts for 33 percent of all coffee production in the world, and in 2011 the country experienced a drought. Coffee trees had already been weakened by environmental factors, and the drought had a significant impact on production levels. How did individuals react to this kind of shortage? Did the shortage have an impact on price? Take a look at the graph in Figure 1, above. 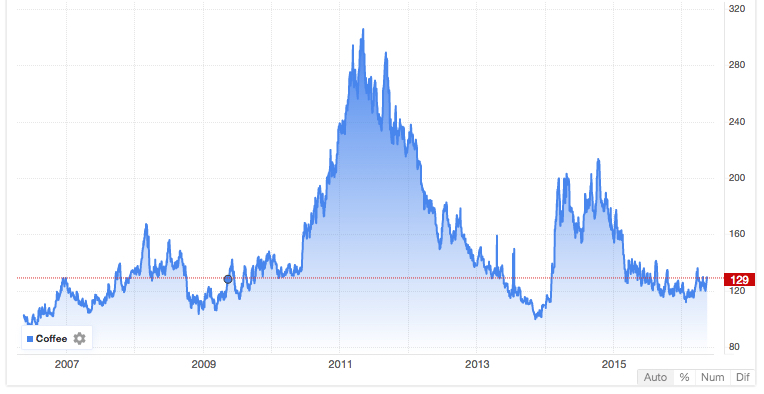 You can see from the sharp spike in 2011 that a shortage in the supply of coffee did indeed have an impact on price. But what do we know about the demand for coffee during that time? Did coffee consumption levels fall? To answer these questions, we need to know more about how buyers and sellers interact in the marketplace. In short, we need to understand supply and demand. In this section you’ll learn about these key economic factors and the laws that govern them. Understanding supply and demand is not only essential to the study of economics—it may also help you be a better-informed consumer and make knowledgeable decisions about everything from your next cup of joe to your next job.